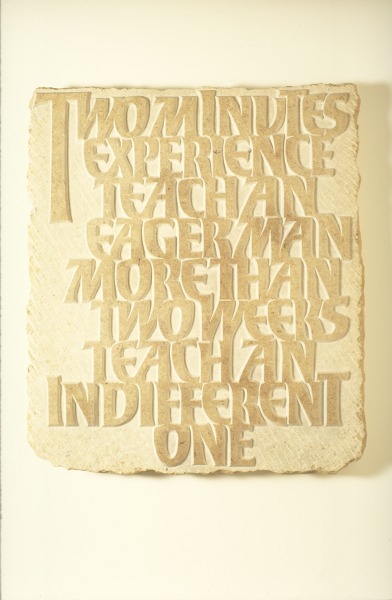 Stone tablet with lettering carved in high relief, 'Two Minutes Experience Teach An Eager Man More Than Two Weeks Teach An Indifferent One'. Purbeck Thornback stone with lettering carved in high relief.The edges of the slab are left undressed; the background to the letters is left with a chiselled finish, the face of the letters is fine rubbed, giving a contrast of textures. The work was carried out entirely with normal letter cutting and carving chisels, dummy, mallet etc. The tablet is mounted, detachably, on a wooden support, for ease of display. The commission for this piece gave me an opportunity to produce an experimental design and explore possibilities not often occurring in the course of my everyday work. I have become particularly interested in the scope for developing lettering as architectural sculpture, and this is a small step in that direction.